It is a very pleasant day that bring happy news for the smart phone lovers, specially the people who want to have a premier Android phone made by QMobile. A decrease in prices of your favourite gadget always gives your a sense of ultimate happiness and satisfaction. High end phones are the toys those everyone wants to play with. When a news of decrease in prices of these phone comes, many people feel joy and pleasure. 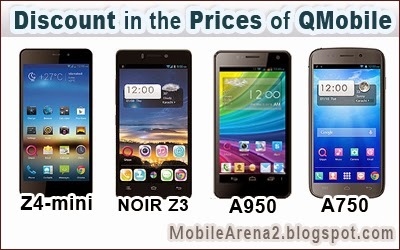 Today QMobile has announced a charming price cut in four of its smart phones. The smart phones which are hit upon a price decrease are QMobile Z4-Mini, NOIR Z3, NOIR V4, NOIR V5, NOIR A700, NOIR A750, NOIR A900 and one year old model NOIR A950. An interesting thing here is this that all of these phones have Quad-Core Processor. Our recently reviewed uni-body single sim supported mobile phone QMobile NOIR Z4-Mini is the premier younger brother of flagship model of the company QMobile NOIR Z4. It undergoes a price decrease of 2,000 PKR and the new price of pin pack QMobile Z4-Mini is only 26,000 PKR only. QMobile NOIR Z3 is also a uni-body phone with single sim supports . It is actually the first phone of Z-series . Its prominent features are the very slim waste line and ultra fast internet browser with a stunnig 8.0 MP auto focus camera. It undergoes a discount of 3,000 rupees and new price of this phone is only 23,500 rupees. QMobile NOIR V5 is a big screen phone with metal body . It undergoes a handsome price decrease of 4,000 PKR . Its previous price was 32,500 that is now only 28,500 . NOIR V4 is the same kind of mobile phone as NOIR V5 but with round edges and slightly lower camera . It got a lessening of 3,000 Rupees in its price and news price of this phablet like smart phone is announced as 26,500 PKR. Next phone that undergoes a price cut is NOIR A750 which experienced a powerful price downing strike worth of 3,000PKR . Its new price is 25,000 Rupees including all governments taxes . Name of QMobile A700 is also enrolled in this list and it got a price cut of 1,500 PKR . Its new price is only 20,000 announced by company . This is a phone that has very low sale results and the ratio of decrease in price is very low in this case . This phone , in our view, should have more discount in its price. Anyway its company's strategy to give a relatively smaller discount on it as compared to other models. QMobile's hot cake model NOIR A900 has very sublime outlook and inside features . Its a very good news for mobile phone lovers that the company has also announced a concession on the price of this delicious piece of art. With the mitigation of 1,600 Rupees , its new price is 20,900 Rupees now. 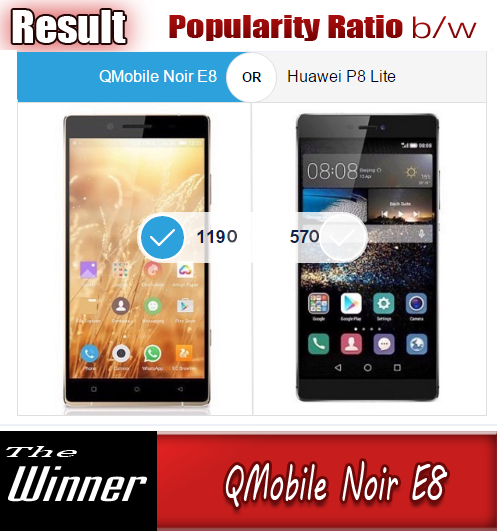 Almost a year old model of the company is QMobile NOIR A950 . It is the last phone in the list of the smart phones which has got a price cut today . It also experienced a price decrease of 3,000 PKR and it is now available at the price of 22,500 Rupees. The lessening of prices of new handsets will also affect the prices of used mobile phones and you can enjoy the new prices of these models in used condition after some days .